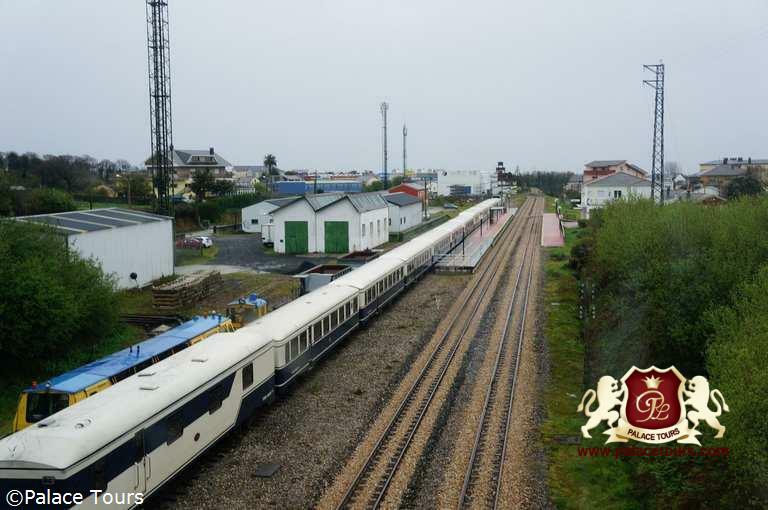 Step aboard El Transcantábrico Clasico, Spain’s first luxury train, for a marvelous journey of 8 days and 7 nights between León and Santiago de Compostela. 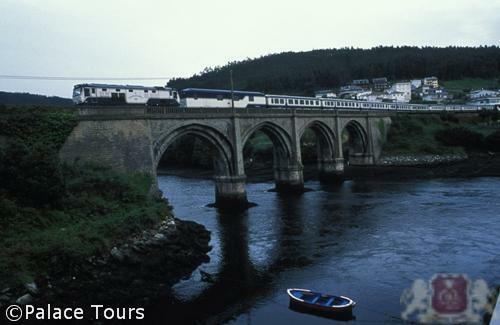 Inaugurated in 1983, El Transcantábrico runs along the same railway lines as the old coal trains of the historic La Robla Railway, which took coal from León to Biscay. 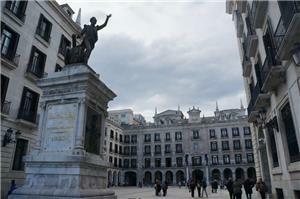 Experience the history of Spain from prehistoric times to present day. 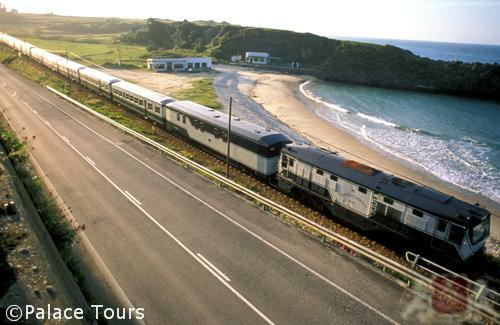 Discover the cities and villages of northern Spain as the train winds its way by the Bay of Biscay, which lies between steep mountains and green meadows and past beaches and cliffs. 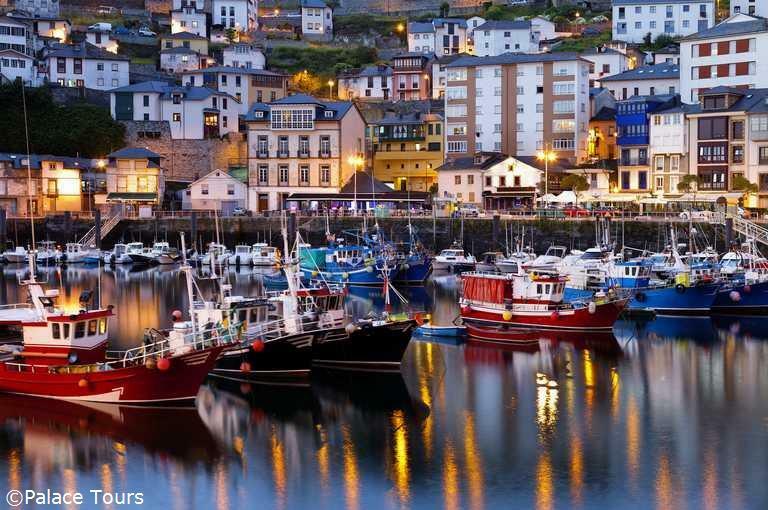 These destinations are full of enchantment and history that over the centuries have become living works of art, like Santiago de Compostela, Vivero, Oviedo, Ribadesella, Llanes, Santillana del Mar, Santander, Bilbao, Carrión de los Condes and León. 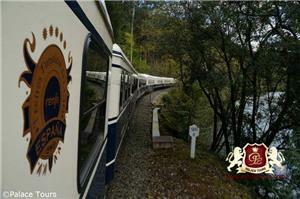 Watch a Video of the Train and you will understand why it is an experience not to be missed! On this page, you can find important information regarding all aspects of the trip and can make your reservations online by clicking "Book This Tour." You may also download a brochure for your reference. 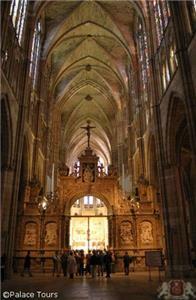 Rendezvous in León. Reception and tour of the old town, home to some of the most important monuments in Spain: the Gothic Cathedral, the Romanesque frescoes in the Basilica of San Isidoro and the impressive Plateresque facade of the Hospital of San Marcos. After lunch, board our luxury coach for a short trip to San Feliz, where our train El Transcantábrico will be waiting for us. 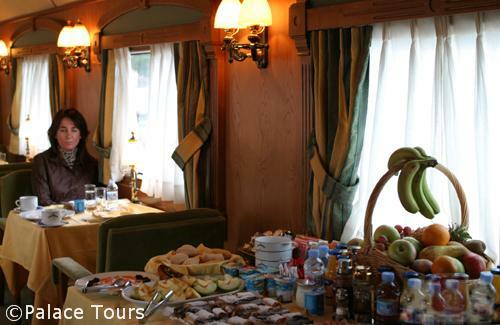 The crew will offer a welcome drink and we can settle into our suites while the train heads to Cistierna for dinner onboard. Just as every day, we begin the journey with a delicious buffet and a la carte breakfast. 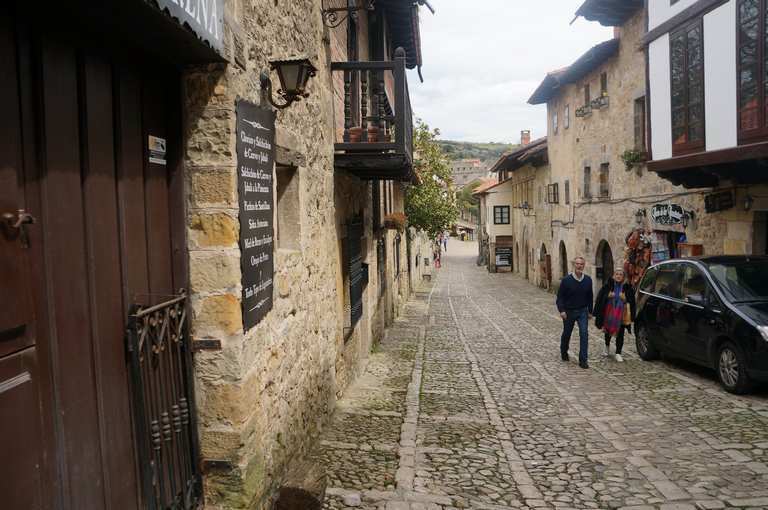 El Transcantábrico will travel to Guardo station, from where we will board our coach to visit the Roman villa of La Olmeda in Saldaña and its superb collection of mosaics. Next we will see the best collections of Romanesque Art in Europe, located in the Palencia villages of Carrión de los Condes, Villalcázar de Sirga and Frómista. Return to the train and enjoy the stunning scenery of the valley of Villasana de Mena. Dinner and overnight in Villasana de Mena. 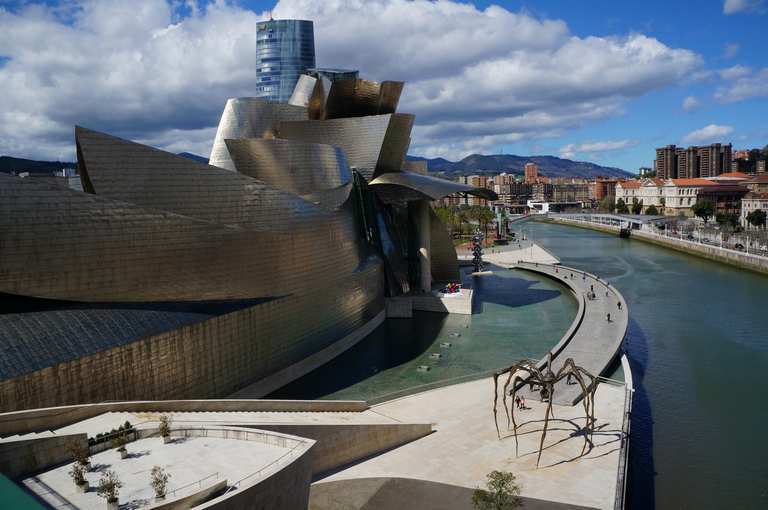 Train trip to the dynamic city of Bilbao, the largest in the Basque Country that has managed to reinvent itself after the decline of its heavy industry. 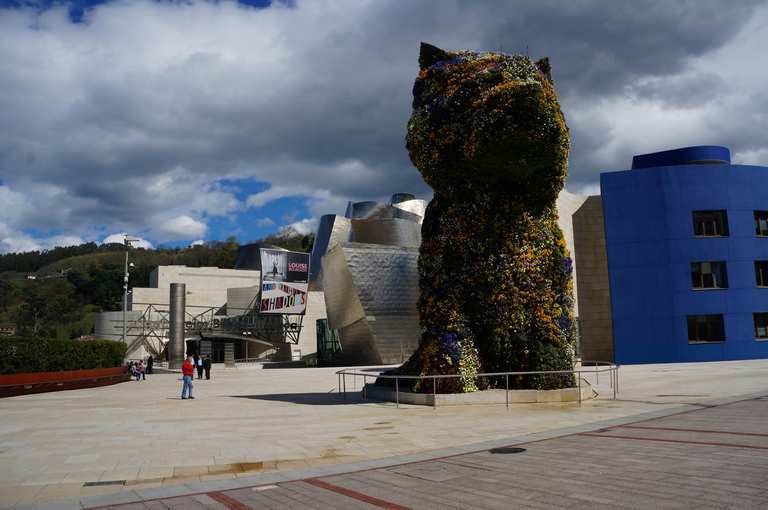 If you travel in July and August, a ticket to the epitome of a new Bilbao, the Guggenheim Museum, is included (it is closed on Mondays the rest of the year). Lunch onboard while travelling to Santander, the elegant capital of Cantabria. City sightseeing tour and free time. After dinner, you may choose to visit El Gran Casino at your own pace (admission included). 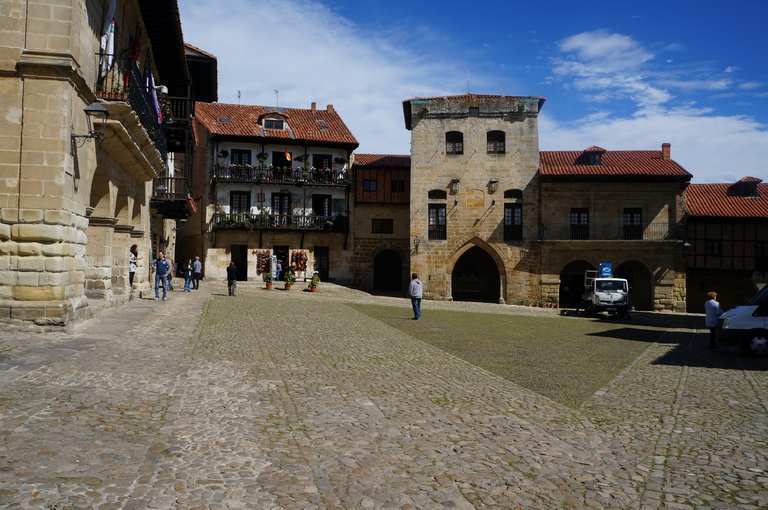 El Transcantábrico will travel to Cabezón de la Sal, from where our coach will take us to visit the town of Santillana del Mar with its beautifully preserved medieval town. Next stop at the Neocave of Altamira, the finest realistic example of Upper Palaeolithic cave art. 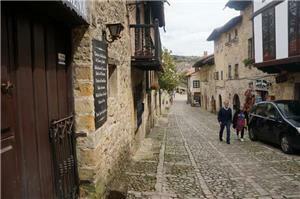 After lunch, we will travel into Asturian territory, visiting the village of Ribadesella and its charming promenade. 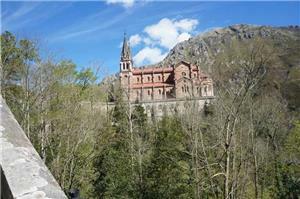 Today we will visit the heart of the Principality of Asturias, driving up to the Picos de Europa National Park. First stop will be at Lake Enol, followed by the Shrine of Covadonga, where our guide will tell us about this sacred place’s stories and legends. Back onboard for lunch and trip to the region’s capital, Oviedo, exponent of Asturian Romanesque art featuring gems such as the basilica of San Julian de los Prados. City tour and free time. Dinner onboard and overnight in Candás. 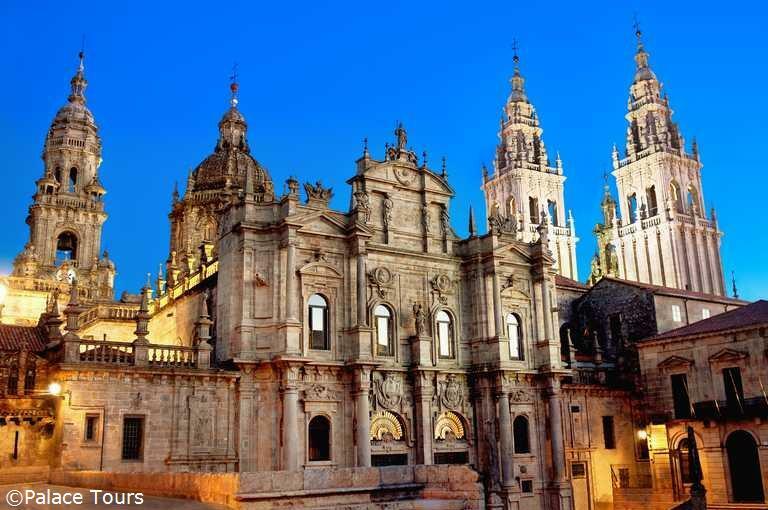 We begin the day discovering Avilés, an ancient city with a precious old town, and Gijón, a city that opens up to the Cantabrian Sea and is alive with cultural events. 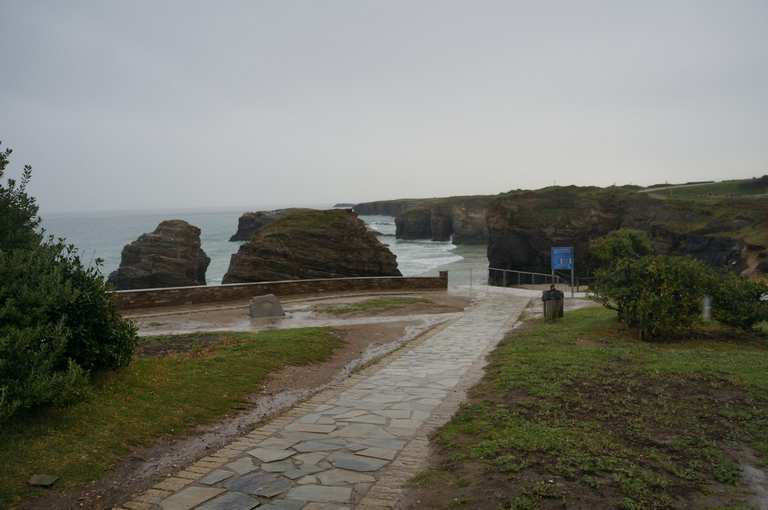 After visiting both towns, return to El Transcantábrico to continue our journey to Luarca, known as the White Town of the Green Coast. 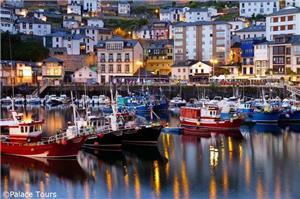 Visit this charming town, where we will also have dinner. 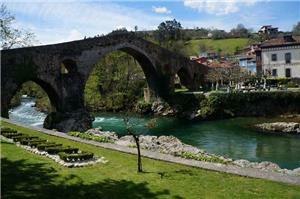 Train trip to the historic town of Ribadeo, in Galician lands, bordering Asturias. 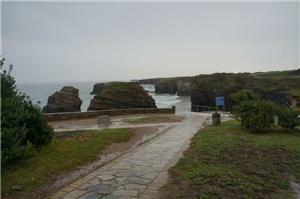 Our coach will take us to the Las Catedrales Beach, one of the most spectacular beaches in the world. 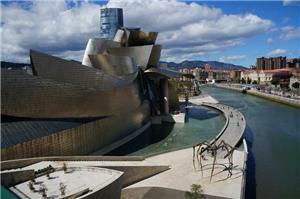 City sightseeing in Ribadeo and free time. 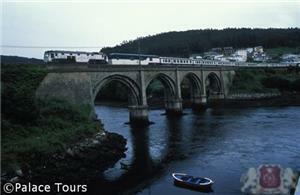 Back on the train for lunch and trip to Viveiro, with city tour and free time. End of trip after the tour. Triple occupancy fare is only available on El Transcantabrico Gran Lujo tours. 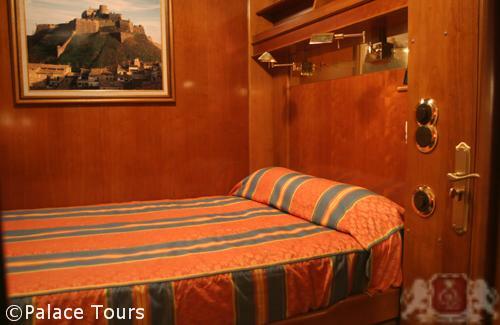 However, a child below 12 years of age can be accommodated in a cabin as the third person for this tour. Please contact us for rates. A la carte and buffet breakfast every day. Activities onboard: music and live performances, parties in the pub car, show cooking and cocktails, dancing, etc. 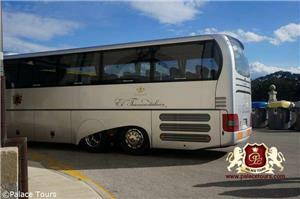 **Partial tours are occasionally available for El Transcatabrico Clasico. Please contact our office for availability and details. 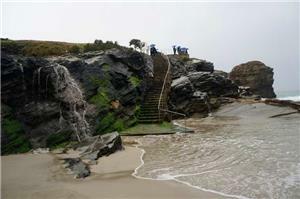 The above inclusions apply only to the full tour. Up to 30 days before departure: refund 15% of full official price. Between 30 and 15 days: refund less 25% of the total. Since these are international terms an additional 5 days will be added in order to process refunds. An additional 15% Administrative fee will be charged from Palace Tours against refunds. 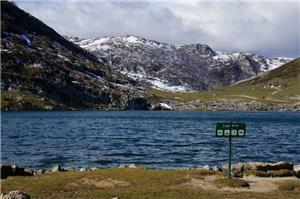 The above times are based on local time of the destination where the tour is provided. In order to provide enough time for processing cancellation, guests need to add 3 business days to the above timeframes. An administration fee of 15% on any monies to be refunded to the client will be charged prior to refund. Elegantly detailed with elements dating from the 1920s and outfitted with modern amenities, the saloon cars of El Transcantabrico Clasico will help you relive a time when train travel was a relaxed affair extending over several days. 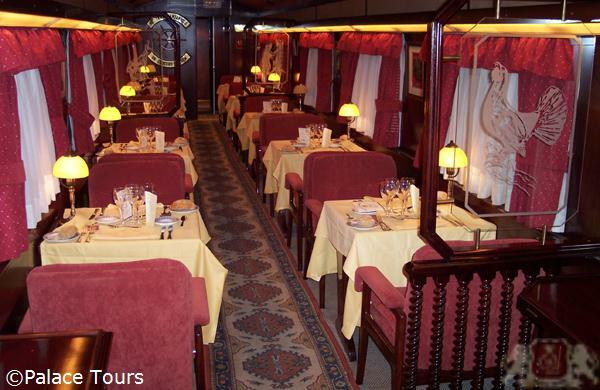 Once you are in the dining car you will be able to enjoy an a la carte breakfast cooked by the chef and his team or opt for a buffet option. Lunches and most of the dinners during tours on El Transcantabrico Clasico are also served onboard the train. 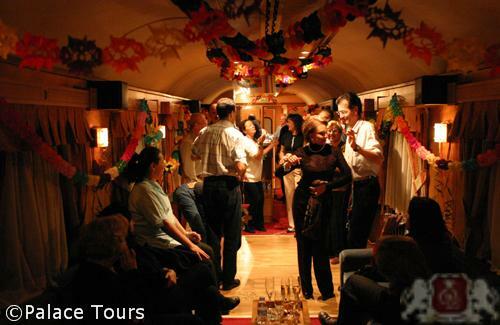 During the day you can also head to the Bar Car and enjoy drinks with your family and friends or relax in the Tea Salon with a cup of coffee or tea. 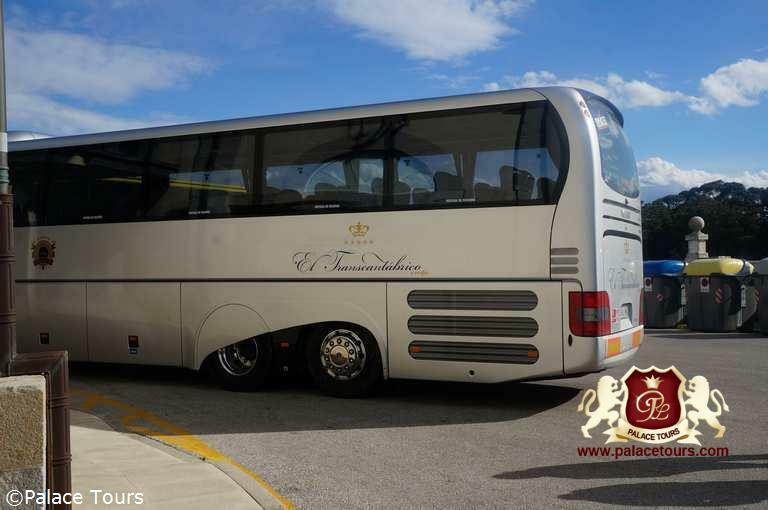 If you just want to watch the beautiful scenery roll by, the Panorama Coach is the perfect place and you can also relax here while watching TV or reading. Elsewhere in the Entertainment Saloon you can hang out until the early hours of the morning and dance your cares away in a night club. El Transcantabrico Clasico only consists of one type of suite. 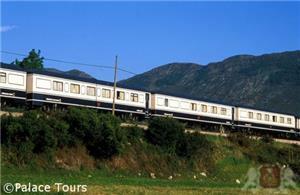 Running for almost 30 years, El Transcantabrico Clasico is also one of the most famous luxury trains in Spain. 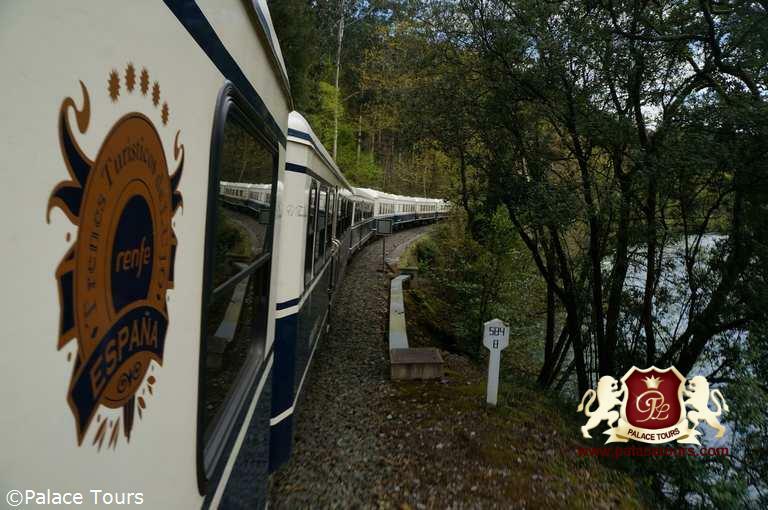 Each of the cabins onboard this train have been extensively remodeled over the years, and you will find that they have beautiful décor that transports travelers back to the golden age of luxurious train journeys. 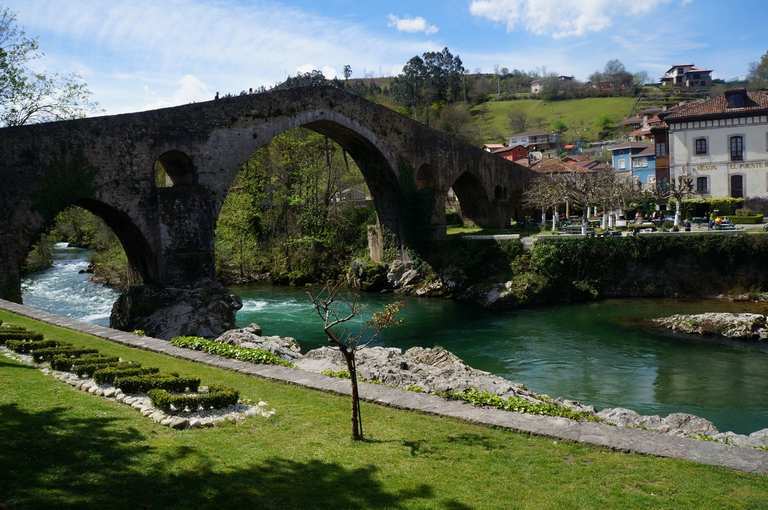 As you pass through the Basque region of Spain and its many cities and principalities, such as Asturias, you will be able to taste the various regional cuisine on El Transcantabrico Clasico and immerse yourself in the splendid scenery. 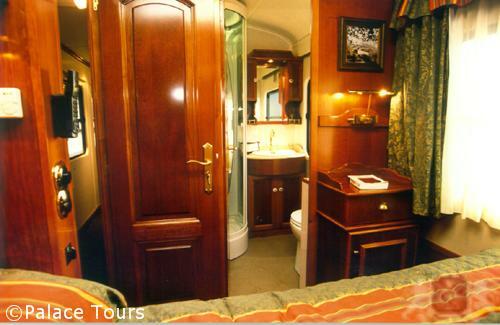 Comfortable and spacious, each cabin on El Transcantabrico Clasico allows you to rest and relax in privacy. They are outfitted with all the necessities that you need and come with fine wood panels, carpeting and brass fittings. Each of these suites has an en-suite bathroom and come with a shower and sauna facility. One double bed (120cm x 185cm or about 4ft x 6ft), and one fold-down bunk bed. Please note that the smaller size of these beds may make it difficult for someone over 6’ 3” to sleep comfortably. Additionally, we do not recommend that adults use the fold-down bed, but it can be used for extra storage or for children under 12. 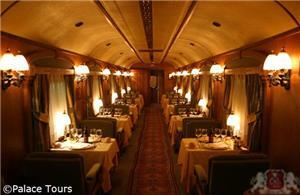 There are 24 suites on the train.The number of passengers depends on the occupancies sold in that departure. The maximum capacity of the train is 48 passengers. There is no official dress code onboard, but we recommend comfortable shoes and clothes due to the nature of the visits and excursions. 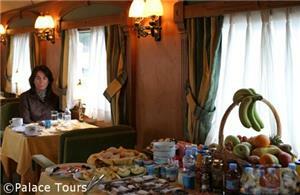 Breakfasts are buffet-style and are served onboard the train in the four lounge carriages. 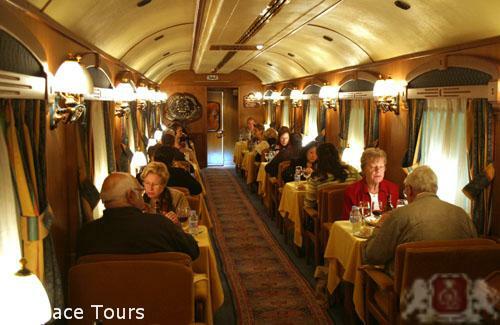 Lunches and dinners are either taken at restaurants in the cities as mentioned in each day’s itinerary, or served in the Restaurant Cars. There is internet access onboard the train but also in cybercenters in several cities along the route. 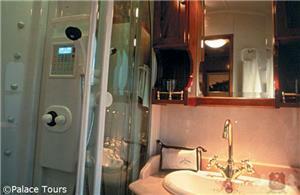 Your room onboard is equipped with a telephone, which you may use for long distance calls (guest’s own account). Phones will generally get reception, however sometimes this is a bit difficult due to the mountains and tunnels along the way. No. Since January 2006, it is forbidden by Law to smoke onboard the train and in the train stations. Are there different types or sizes of rooms onboard the train? 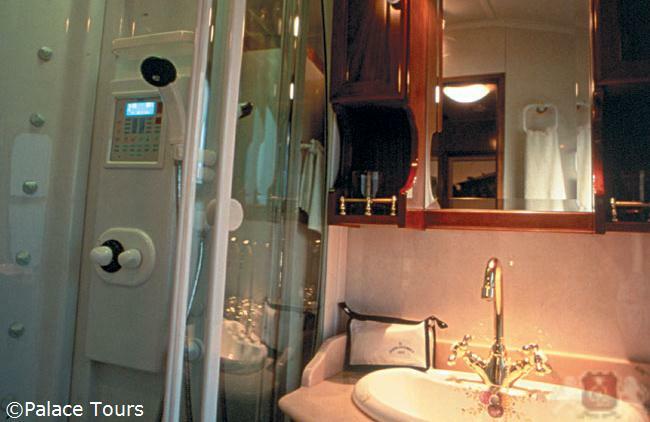 Suites onboard El Transcantabrico are specially designed for rest and privacy. You can sleep in comfort as the train will be parked at a station each night. This means that your sleep will not be disturbed by moving and jolting and also gives those who enjoy nightlife an opportunity to go out and savor the atmosphere of each town. El Transcantábrico Clásico has 24 Classic Suites. They all have a double/matrimonial bed (120cm x 185cm or about 4ft x 6 ft) and some offer the chance to have an independent bunk bed. Due to the small size of the bunk, we recommend that the bunk is only used for children under the age of 12 or for extra storage. The suites measure 64.8 square feet, or 6 square meters.The private ensuite bathroom has a hydro sauna, turbo massage and steam bath and a hairdryer. The air-conditioning and heating, piped music and lights are all controlled individually. The electrical power is 220 volts. All suites are equipped with a luggage rack, minibar, safe deposit box, wardrobe, writing desk and a telephone with an outside line. The rooms are assigned on-site. If you have any specific room requirements, please contact us at least one month prior to departure so that we can send your request to our Operations Team. Yes, there is a hairdryer provided in every bathroom, along with a dental set, comb, eau de toilette, shaving set, shower cap, shoe polish and more. Do I have to stay onboard all seven nights? You are not required to stay onboard the train for seven nights. 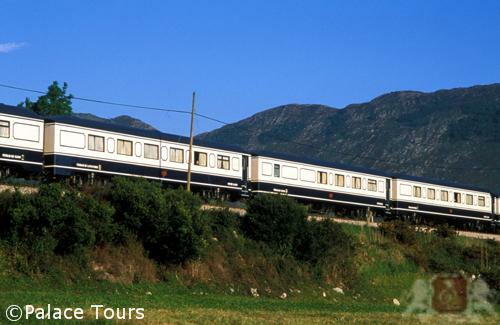 However, as the train follows a fixed itinerary, you will be responsible for your own transportation to/from your points of embarkation/disembarkation, for any hotels you use during the journey, for meals taken while separated from the group, etc. There are no refunds for unused portions of the tour. Therefore, should you choose to shorten the journey in any way, you are still required to pay for the full seven-night tour. El Transcantabrico is a very inclusive experience, so you will not need to pay for any meals, beverages during lunch/dinner, sightseeing, monument entrances or accommodations. You will incur additional cost if you choose to purchase any additional beverages onboard; laundry services; camera fees at monuments; transfers, additional sightseeing or other services in Leon or Santiago de Compostela; gratuities; and/or souvenirs. When should I plan to arrive in Leon? 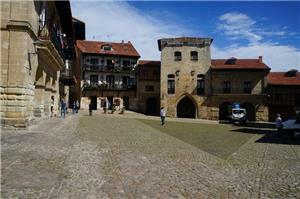 The meeting time for the tour is 12:00 noon on Saturday. Full instructions will be printed on your travel voucher. 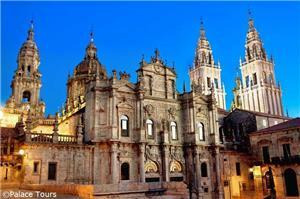 We recommend arriving in Leon at least 1 day prior to your tour so that you may acclimate and relax prior to embarking on your exciting rail journey. The size of the bed is dependent on the type of suite you reserve. The El Transcantabrico train does have wifi in the lounge of the train, although the signal is not strong and may not reach outside of the lounge car. (The signal is also best when the train is stationed.) You may use the computer in the lounge provided for guests' convenience, or you may connect to the train's wifi using your personal laptop, tablet or device.